Hollywood star Sherri Champlain has a problem. 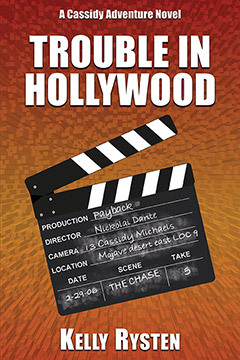 On location in the Mojave Desert, a prankster has targeted her and she wants the pranks to stop. She could hire a posse of rent-a-cops, but there is only one person in the area that Sherri knows and trusts: reserve deputy and local tracker Cassidy Michaels. Sherri knows Cassidy is one smart cookie because she rescued Sherri when she was stranded in the mountains with a broken leg. Cassidy thinks the proposition sounds like a cushy job. All she has to do is babysit a movie star for five weeks. The pay is excellent. What could go wrong? Cassidy finds out as the pranks turn from harmless to hilarious to extremely hazardous, with Sherri and Cassidy in the cross-hairs. Kelly Rysten was born in Rockledge, Florida and grew up in Las Cruces, New Mexico. She enjoys geocaching, oil painting, and exploring the deserts and mountains of the southwest. She lives in Southern California with her husband, Gary, has two grown children, and three grandchildren. She has published six Cassidy Adventure Novels and a standalone action adventure romance novel titled Geogirl. She has published some of her geocaching adventures in FTF Geocacher Magazine and in two Geocaching GPS: Great Personal Stories anthologies. She is always working toward getting a new Cassidy adventure published so stay tuned! Mention the title, author and/or ISBN 978-1-77143-294-8.